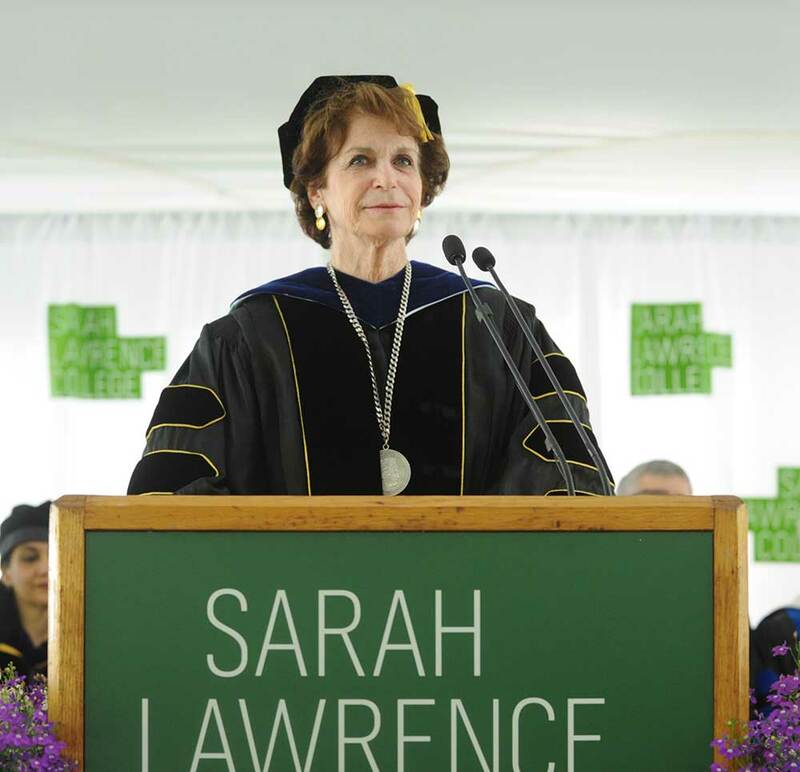 On behalf of the Trustees, faculty, and staff of Sarah Lawrence College, I am delighted to welcome you to the Commencement of the class of 2016. To the graduating class, let me say that we have taken great pleasure in witnessing in you the “transformative” effect that Sarah Lawrence alumni identify as the legacy of their educations. Along with our graduates, today we honor the family members in the audience, particularly the parents, whose love and commitment have supported our students. I want to thank you for entrusting them to us and for supporting their educations, often through real sacrifice. Members of the class of 2016, would you please stand and recognize the family members and friends who have made this moment possible? This is the second year that we have held separate commencement ceremonies for our master’s and bachelor degree candidates. Yesterday, 122 master’s candidates in our nine graduate programs received their degrees and were joyfully “hooded” by a special faculty member in their programs. We heard an address from Joan Marks, an alumna of the College who developed our pioneering program in human genetics counseling. Our graduate and undergraduate programs nourish each other in many ways; as a matter of fact, in our commencement ceremonies yesterday, a number of our Sarah Lawrence undergraduate alumni received their BA/MA degrees, proudly doubling their Sarah Lawrence alumni status. But today is your day, our 282 Sarah Lawrence baccalaureate degree recipients. Your rousing response as your dons and teachers processed up the aisle acknowledges that the faculty are, as the Princeton Review noted a couple of years ago, the best in the country. One measure of their impact is palpable when our alumni get together—even at their 50th reunion—which, I realize, seems very far away—they regale each other with stories of their dons and teachers and many can recall every conference paper they ever produced. As we celebrate the commencement of the class of 2016, I’d like to offer brief remarks about a topic raised by another president who is nearing the end of his presidential term, Barack Obama. In his commencement speech two weeks ago at Howard University, the president spoke of the concept of empathy. In doing so, he was returning to a definition of empathy he offered in his autobiography, The Audacity of Hope: Thoughts on Reclaiming the American Dream, where he defines it as “not simply a call to sympathy or charity, but as something more demanding, a call to stand in somebody else’s shoes and see through their eyes.” In his commencement speech, he made the point that we are particularly in need of empathy at this juncture in our country’s history. I believe it is also a valuable concept for thinking through our own campus experience as well. I’d like to turn to literature, one of my favorite points of departure. As a teacher of twentieth-century literature, I have long believed that reading novels—particularly complex, capacious, multi-voiced novels—is one of the best tools we have for inhabiting someone else’s thoughts and beliefs. This is freshly on my mind, since just last month I had the pleasure of guest teaching in Bill Shullenberger’s class on James Joyce’s Ulysses, and have been thinking just how well the novel makes a case for the development of empathy through reading fiction. As Bill’s students, and, I’m sure, others in the audience know, the novel takes place during one day in the lives of ordinary Dubliners. Over more than 600 pages, the reader is invited to see the world through their eyes and virtually inhabit their bodies. Through a technique called interior monologue, we get to dwell in their memories, perceptions, affections, and peccadillos, as they traverse the Dublin streets (or get in and out of bed, if they happen to be Molly Bloom). The upshot is that we know Leopold Bloom better than we know our best friends. A testament to the power of our empathy for Bloom is the fact that June 16, the day on which we fictionally accompany him through Dublin, has come to be known worldwide as Bloomsday. But literature is not the only vehicle for expanding the moral imagination—it’s also what a liberal education, in general, is meant to do. With its emphasis on social justice, our own progressive education at Sarah Lawrence depends on putting oneself in someone else’s shoes and heeding a call to action to equalize the odds. In its best version of itself, the College has empathy at its core. I believe that, fundamentally, this kind of empathy is the basis for the social movements on our campus, including the protests that we have witnessed at Sarah Lawrence during the past year. But what complex novels have to teach us—sometimes forgotten in real life—is that social reality is what the Russian philosopher and critic Mikhail Bakhtin called “dialogic”—comprised of multiple, sometimes competing voices, discourses, codes, and positions. Novels are tissues of complexity, and because good fiction is not propaganda, it rarely conveys only one version of truth. In his speech at Howard University, President Obama emphasized empathy as an antidote to monologic thinking and the demonization of the other. “If you think that the only way forward is to be as uncompromising as possible, you will feel good about yourself, you will enjoy a certain moral purity, but you’re not going to get what you want.” I would add another caution: you may inadvertently trample on the very kind of respect that you are trying so hard to bolster in society. In other words, it’s important to understand college politics in a dialogic way. Sarah Lawrence is such a space as well—dialogic and complicated—a space in theory dedicated to the respect for individuals and their differences, and a space dedicated to the common good. At the college, as in literature, empathy is a powerful tool for walking in someone else’s shoes. But empathy also means remembering that there is another human being on the other side of the door. Class of 2016, as you leave the College, we trust you’ll discover that a Sarah Lawrence education provides what Kenneth Burke has called “equipment for living.” Now, go put those qualities and tools to work. We expect nothing less of you than to change for the better your communities, your workplaces, your relationships, your nations, and your world.